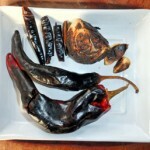 Soak the chiles in water for 10 minutes to remove their sour burnt flavor. Mix and grind all ingredients to a paste using 2 to 3 tablespoons of oil. Rub the meat and let it rest overnight. Cook the meat slow the following day.